With school just around the corner, now is the time to begin firing back up the brain for learning! One of the subjects that kids struggle with most, especially in elementary school, is spelling. Remember writing those long lists of spelling words over and over again? While those exercises may have helped us memorize the correct way to spell words, they may also have caused us to dread spelling class. 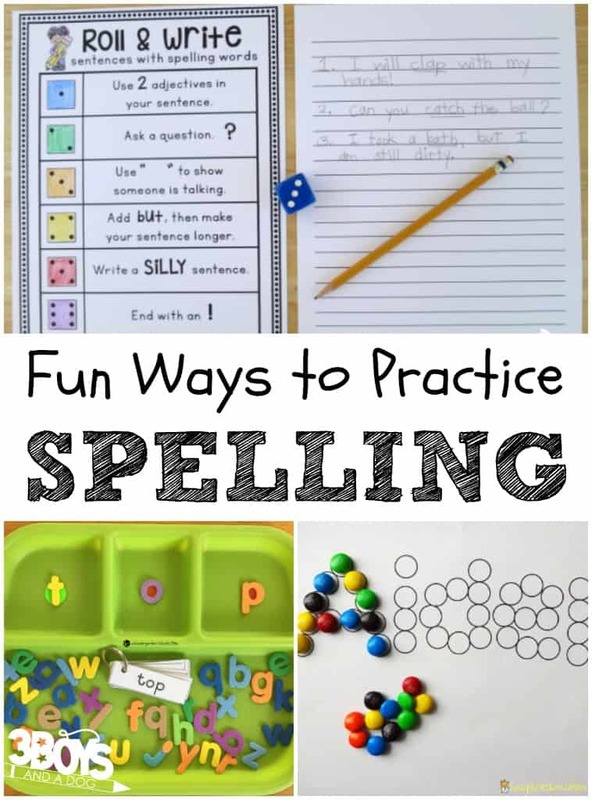 Now, though, there are plenty of fun ways to practice spelling and I’ve rounded up ten different ideas you can try with your children! 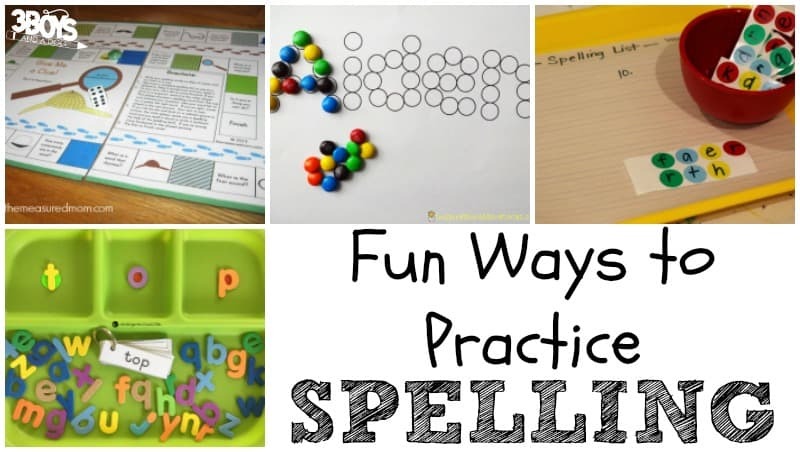 For more spelling ideas, try this list of 15 free spelling games you can use at home! 1. Use manipulatives. Try these Roll and Write Sentences, which allow kids to get spelling practice while playing with dice! 2. Work on syllable counting. Pick up these Scarecrow Syllables printables to help kids listen for syllables! 3. Play spelling games. This printable spelling board game is perfect for hands-on spelling practice! 4. Practice with a spelling curriculum. Try this weekly spelling curriculum to help third graders master spelling vocabulary words! 5. Spell with candy. 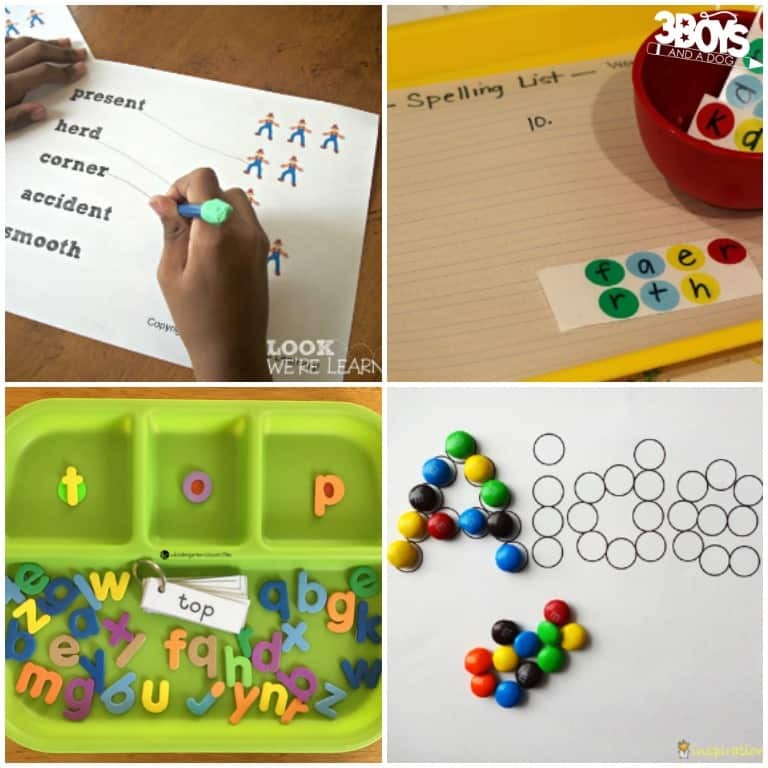 These dot spelling printables are perfect for use with small candies such as M&Ms or Skittles! 6. Use a spelling letter tray. Kindergartners can practice spelling CVC words with this fun spelling letter activity! 7. Let kids use their fingers. When handwriting skills are lacking, letting kids spell by writing with their fingers is a no-stress way to practice spelling. This fun window writing activity is perfect for young ones! 8. Try a spelling puzzle. This smart DIY Spelling Puzzle upcycles a puzzle into a spelling activity for kids! 9. Add in fine motor skills. Working with this Dot Sticker Spelling Scramble is good spelling and fine motor practice in one! 10. Work with flashcards. Pick up these short vowel flashcards to help kids memorize the spellings of common words using short vowels! These affiliate resources from Amazon make spelling practice fun for kids! These 50+ Ways to Use Flashcards can be used for spelling flashcards, too! Love these ideas! The one on the lawn looks like such fun – what a great way to breathe new life into a scrabble like game!